Gabriella Costa received her music degree at Conservatorio Santa Cecilia in Rome. She also is a pianist, musicologist and Professor. She graduated and wrote a thesis on “Samuel Barber and his songs”. Gabriella’s vocal repertoire is really vaste and ranges from italian opera repertoire baroque, to contemporary music. Her operatic appearances also include many prémieres of contemporary composers. She speaks english, french and german fluently. Gabriella Costa has worked with such notable conductors like Sir J.Tate, M.Soustrot, V.Yurovsky, H.Soudant, E. Pidò, N. Bareza, A. Campori, A. De Marchi, G. Gelmetti, G. Ferro, A. Fischer, I. Karabtchevsky, F. Welser-Möst, K. Weise, M. Plasson, L. Hager, T. Guschlbauer, S. Ranzani, S.A. Reck, W. Humburg, Lü Ja, and renowned directors: R. Abbado, J. Miller, R. Andò, G. Barberio Corsetti, U. Gregoretti, D. Krief, L. Puggelli, G.Pressburger, M. Scaparro. Gabriella was often heard in german repertoire roles: (Blondchen) in Die Entführung aus dem Serail and Zauberflöte at the Opernhaus in Zurich and (Giovane fanciulla) in Schönberg's Moses und Aaron at the Teatro Massimo in Palermo, (Ännchen) Freischütz at Teatro la Fenice in Venice. Concerning the baroque repertoire, she has appeared with excellent specialized baroque orchestras and conductors: l’Academia Montis Regalis and Alessandro De Marchi, Ottavio Dantone and Accademia Bizantina (in Vivaldi’s Olimpiade at the baroque International festival in Jesi ). In Bergamo’s Teatro Donizetti she recently appeared in N. Piccinni’s La Cecchina in the title role, conducted by Stefano Montanari. She also made her debut, conducted by Diego Fasolis, in la Passione di Gesù Cristo by G. Paisiello at Teatro Carlo Felice in Genova. With M° Claudio Scimone and Solisti Veneti, she regularly collaborates in concerts, Opera productions and worldwide tours. In november 2017 a CD/ DVD by Naxos was released, od L. Vinci’s opera Didone Abbandonata, successfully performed in Florence’e Teatro Comunale. Gabriella has also unique artistic collaborations with many of today’s most celebrated composers including Michael Nyman (italian prémieres of his songs), Marco Betta whose Sette storie per lasciare il mondo she performend in Teatro V. Bellini in Catania, Sergio Rendine (Un segreto di importanza), Giorgio Battistelli whose Prova d’Orchestra she performed at Teatro dell’Opera di Roma. She lately made a debut of The Whitches of Venice, opera written by Philip Glass and performed at Teatro Massimo in Palermo and on October 2017, Pascal Dusapin’s Medea, conducted byMarcoAngius. Her concert appearances also include Ein Deutches Requiem in Nantes with the Orchestre des Pays de Loire and Die Sieben Letzten Wörter unser Erlösers am Kreuze by L. Spohr with Orchestra and Choir of the Teatro dell’Opera di Roma, the Fauré Requiem at Teatro Massimo V. Bellini di Catania Wight M° M. Soustrot. Orchestral engagements have also incuded the 1st soprano role in Mozart’s Great Mass in C min. with the Orchestra and Choir of the Teatro Fenice. This production was also recorded for video and television transmission and broadcast worldwide live over the radio RAI 1 radio and tv network. With the Orchestra di Roma e del Lazio she has performed opera recitals conducted by M°Lü Ja. 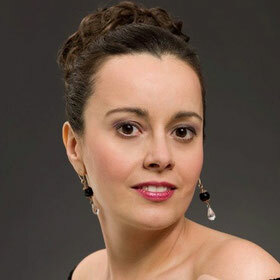 Gabriella Costa is also considered the italian specialist of L. Boccherini’s Stabat Mater. She appeared on january 2013 in RAI1 main italian TV broadcast to sing excerpts of Stabat Mater. Boccherini's Stabat was also recorded and broadcast live over the BBC and RAI RADIO 3 to commemorate the death of Pope Giovanni Paolo II.